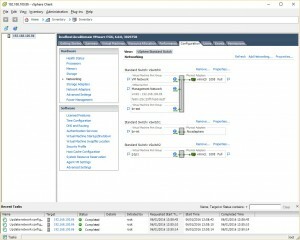 Just a quick post on Interface ordering when using vmxnet3 on VMware. When you add more than 4 vmxnet3 data interfaces, on the addition of the 5th interface you may see that interface ordering is no longer sequential. This is not a vMX specific issue, it is due to the way the VMware balances PCI slot numbers to the guest PCI bus topology. More info here. As you can see, the interface ordering is no longer sequential. Power off the VFP VM and open the VMware Edit Settings page. If you are using the vSphere Web Client, select the VM Options tab, click Advanced in the left frame, and click Edit Configuration at the bottom of the page. 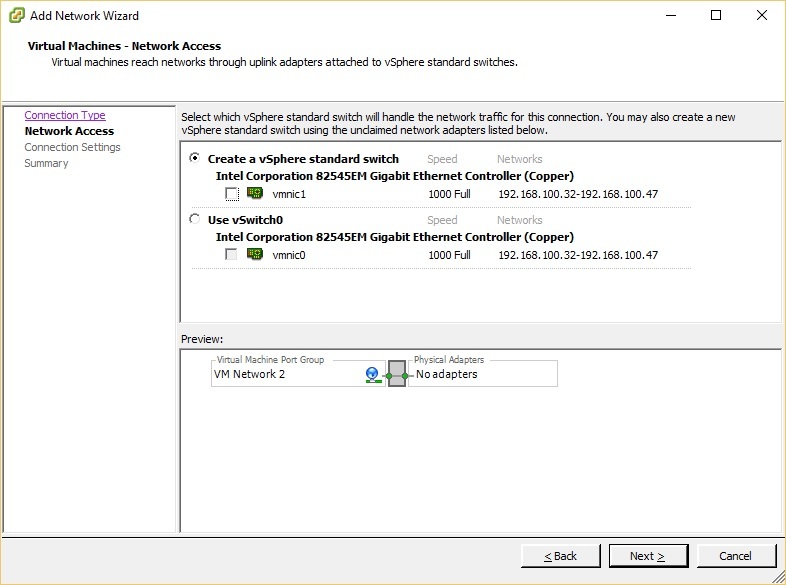 Click OK to update the VM settings, and then add any further vmxnet3 network adapters as may be required. Now power up the VFP VM and check that the interface ordering is now correct. My Day One book on the vMX is now available – the book gives an introduction to vMX and then goes on to walk through a complete build of it on Ubuntu Linux (Junipers preferred distribution). So you can get familiar with vMX and Junos, you will get straight in to the Lab and build and scale a topology, learning about EVPN and VPLS along the way. The Day One is for network engineers or architects who are interested in learning more about vMX, and KVM in general. You might be thinking about how to deploy vMX in a production environment, or how to build and scale a lab or simulation, without access to physical routers. It was a fun project and I’d like to thank Juniper for the opportunity. Also thanks to Said van de Klundert for the review of the Day One. As of Junos 15.1F4, Juniper are now officially supporting vMX on Vmware. The installation process has quite a few steps to it, so following on my my vMX Getting Started Guide for KVM, here is a quick post showing you how to do it on your home lab running Vmware Hypervisor ESXi 6.0. Let’s get started with the installation of ESXi. I’m doing this running ESXi as a nested VM on a Macbook, but the process would be the same if you were doing it on bare metal. Register with Vmware and download the ESXi ISO from Vmware and then boot your machine from the ISO. The installation of ESXi is a simple process. Go through the installation steps one by one and reboot ESXi once the installation has completed. Following the reboot ESXi will load up and if your management LAN is running DHCP the host will have been assigned an IP address for management. 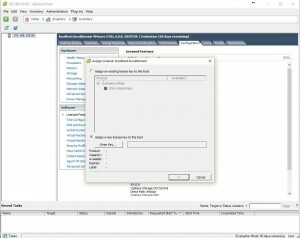 You need to download the VMware client to be able to manage ESXi free. 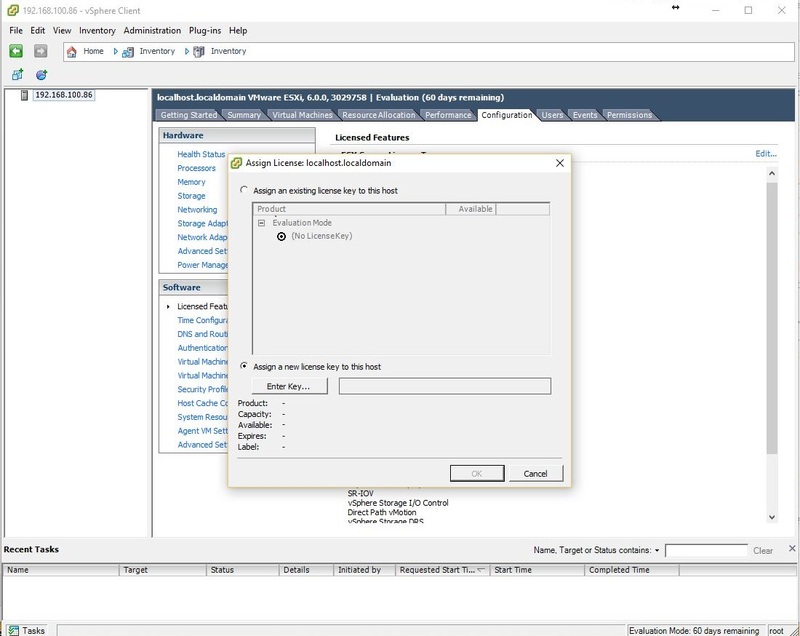 Open a web browser and connect to the ESXi IP – download the tools as suggested, and then load up the client. Once the client is loaded, firstly you should license the ESXi host. You can get a free license from Vmware at the ESXi download page. In the web client the license is applied at Home – Inventory – click configuration and then Licensed Features. You can then click edit to apply the license. If you have a valid login, you can download vMX directly from the vMX download page. Now load up the client for your ESXi server and login. There is no OVA build currently, so several steps need to be done manually. Before progressing any further you will need to extract the vMX package. All of the vmdk files are located in the subdirectory “/vmdk”. metadata_usb.vmdk: Virtual hard disk with bootstrapping information. This is used by the VCP. Click the summary tab, select the datastore under Storage, right click and select Browse Datastore. Create a folder called “vmx” and then click the upload file button and upload all of the vmdk files listed above to this new folder. If you are not familiar with vMX then at this point it would be a good idea to read over my vMX Getting Started Guide for KVM, so that you understand the architecture of vMX, and how the vMX virtual machines communicate with one another. 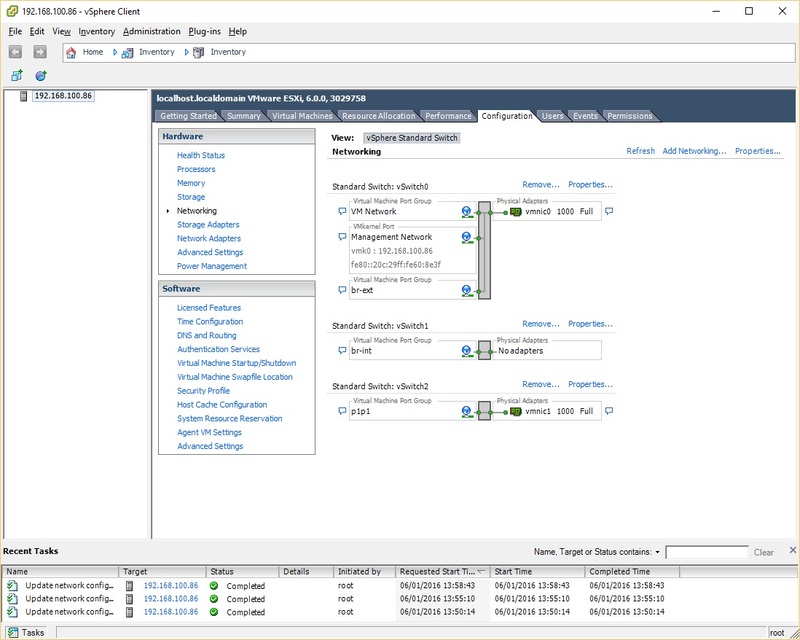 To create these networks, go back to the ESXi client, select the ESXi server and click the Configuration tab. Select Networking under Hardware. In the top right corner click Add networking. You will see the new port group “br-ext” has been added to the standard switch vSwitch0. Again, select Networking under Hardware. In the top right corner click Add networking. Now add a data network, the process is repeated according to the number of data NICs that you wish to add. Time to create a single adapter named p1p1. Repeat this process if you have any more data adapters to add to vMX. 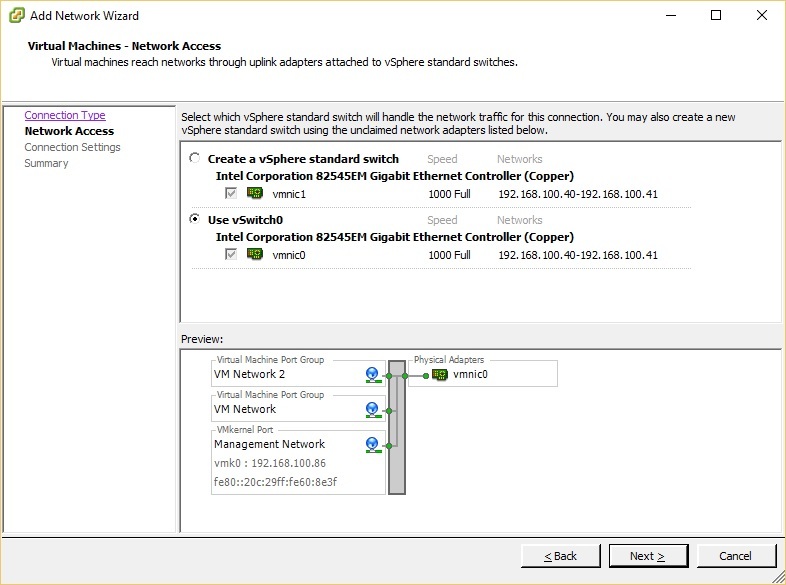 You will now see the 3 networks in the networking summary screen – br-ext, br-int and p1p1. You must enable promiscuous mode in all vSwitches so that packets with any MAC addresses can reach the vMX. e.g. for OSPF to work properly. For each vSwitch, click properties, then select vSwitch and click edit. Select security and change promiscuous mode to accept. Just like vMX on KVM, there are two VMs that must be created – the virtual control plane (VCP) running the Junos OS, and the virtual forwarding plane (VFP) running an x86 visualised release of Trio running on Wind River Linux. The process for creating both of the virtual machines is very similar. 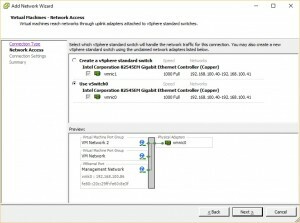 It’s a simple case of following the VMware wizard and choosing the correct settings for the VM. This process below outlines the steps required to create the VCP virtual machine. In the network setup, select 2 network adapters. Asign br-ext as the 1st adapter and br-int as the 2nd adapter. Set both to be e1000. Repeat the add Hard Disk process again this time adding the metadata_usb.vmdk image as the third drive. NOTE: this 3rd hard drive is important – if you don’t configure it then the first time VCP boots, VCP will setup as an “olive” not vMX! You can now boot the VCP! If the boot process appears to wait at “Loading /boot/loader” do not worry, on the VMware release you don’t see the full Junos OS boot process on the console. This process below outlines the steps required to create the VFP virtual machine. 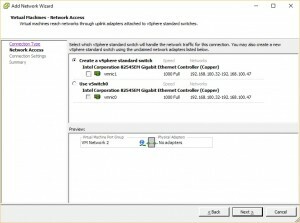 In the network setup, select at least 3 network adapters, assigning br-ext as the 1st adapter and br-int as the 2nd adapter. Set them both to be e1000 adapters. The data adapters can now be selected, set them to vmxnet3 or e1000 depending on your preference. For better performance, I’d suggest you use vmxnet3 because this is a paravirtualization adapter. NOTE: if you wish to use SR-IOV – at the time of writing SR-IOV is not officially supported on VMware, only on KVM. NOTE: on my build the Juniper supplied image needed to be converted to thick provisioned using vmkfstools, otherwise the VM refused to boot (I was getting a VMware error related to free space even though the drives were not full). You may not have to do this! Thanks to @tomverhaeg for working through this strange issue with me! At Ready to Complete, you can click finish and boot the VFP! 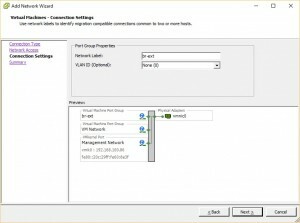 NOTE: VMware virtual console for the VFP does not show anything beyond “Please Wait: Booting” – if you wish to login to the VFP you will need to configure serial console. The process for setting up serial console is described here. At this point if both machines have powered on successfully you should have a running vMX. Now login to the VCP and run the Junos command “show chassis fpc”. After a few moments you should see the FPC as online and ge-* interfaces will appear. For more information, please refer to the Juniper documentation on the VMware release of vMX. 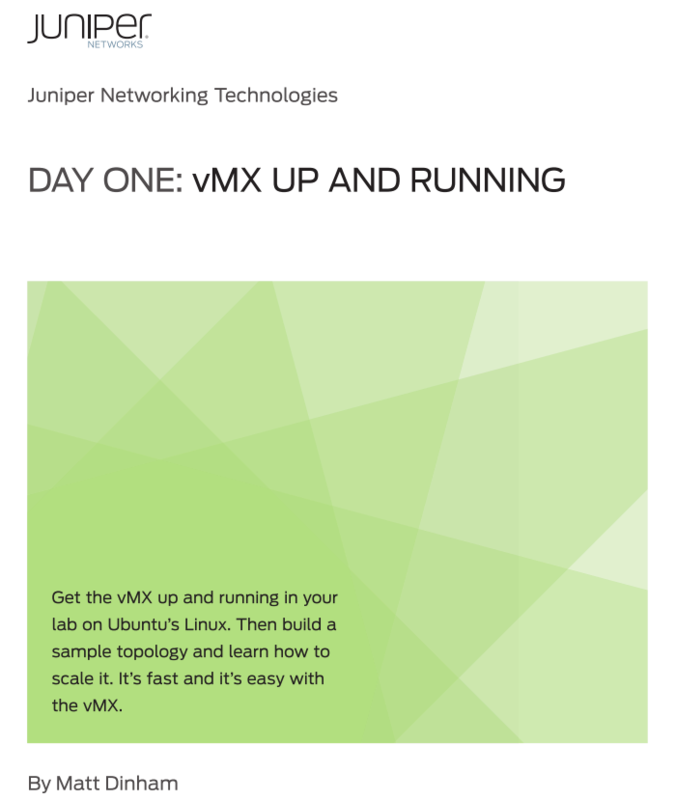 Following my Juniper vMX getting started guide post, I thought it would be useful to show how vMX could be used to create a lab environment. This post follows on immediately where the last one finished. I will create a multi-router topology on a vMX instance using Logical Systems, and then go on to configure EVPN on this topology. As with the previous post, this is all running on my Macbook pro on a nested Ubuntu VM. In this post I will create the following simple topology of 4 MX routers. You will be able to extend the principles shown here to expand your own topology to be as large and complex as you like. The topology will consist of a 2 x vMX running on the same Ubuntu host. I will configure EVPN however EVPN is unfortunately not supported within a Logical System, so R2 and R3 will be the main routers on each vMX and will be my EVPN PEs. R1 and R4 will be created as Logical System routers. I will connect ge-0/0/1 and ge-0/0/2 on each of vMX back to back using a linux bridge and these interfaces will then be used to provide the interconnection between the main router and Logical System using VLANs. I could use LT interfaces but where is the fun in that. ge-0/0/3 on vMX1 and vMX2 will be interconnected using a Linux virtio bridge on the host. First things first, let’s get the second instance of vMX running. If you remember from my 1st vMX post there is a configuration file for the vMX instance. Running a second vMX instance is no different and has it’s own settings file. I will copy vmx1’s config file and use that as the basis for the vMX2. The vMX identifier is changed to vmx2. I am using the same host management interface for both vMX1 and vMX2 and no changes are needed to the images. The external bridge can be used by both vMX1 and vMX2 so no need to change this setting. This is used to bridge the management interfaces on vMX to the host management interface defined above. For the vRE and vPFE I will need to make some changes to console port, management ip address and MAC address. The MAC addresses taken from the locally administered MAC addresses ranges, so no problem to choose my own – taking care not to overlap with vMX1. Also, chose a console port number and management IP address that will not overlap with vMX1. We also need to adjust the MAC addresses on each vMX2 interface. vMX2 is now ready to be built. The same orchestration script that I used to create vMX1 is again used for vMX2, but this time I need to specify the configuration file. Note: each time I use “vmx.sh” to perform stop/start operations on vMX2, I must specify the configuration file for vMX2. The script will create the new vMX instance and automatically start it. I’m now ready to connect to the console on vMX2. This is done the same way for vMX1 and vMX2, we simply reference the correct vMX instance when running the script. If I look at the linux bridges the script automatically created you’ll see that another internal bridge is present to enable the RE and PFE communication on vMX2. The external bridge (management bridge) is shared by all vMX management interfaces. 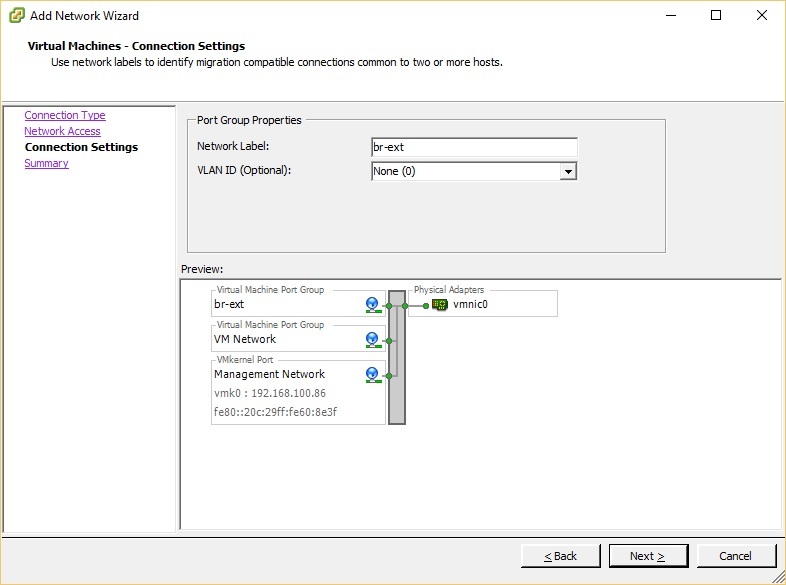 As I did in my vMX getting started post, for the Ethernet connectivity to the vMX I will be using KVM virtio paravirtualisation. virtio bindings are flexible and can be used to map multiple vMX instances to a physical host interface, or to connect vMX instances or vMX interfaces together which we will be doing here. Linux bridges are used to stitch everything together. At this point both vMX1 and vMX2 are running, but I need to create the virtio bindings to enable the communication between each MX. I’ll create a link between vMX1 interfaces ge-0/0/1 and ge-0/0/2. Finally I will create a link between ge-0/0/3 on vMX1 and vMX2. I could use the same technique as shown above, but what if I wanted to connect more than 2 vMX together on the same Ethernet segment? It would be done like this with an additional bridge being defined and shared by each vMX. Now let’s look at what bridges we have! At this point vMX1 and vMX2 are ready to be configured. EVPN is defined in RFC7432. It provides a number of enhancements over VPLS, particularly as MAC address learning now occurs in the control plane and is advertised between PEs using an MP-BGP MAC route. Compared to VPLS which uses data plane flooding to learn MAC addresses, this BGP based approach enables EVPN to limit the flooding of unknown unicast. MAC addresses are now being routed which in multi homed scenarios enables all active links to be utilised. Neat stuff. Also look up the Juniper Day 1 on EVPN. I’ve already configured a base configuration on R2 and R3. Note I changed the chassis network-services mode to enhanced-ip from the vMX default of enhanced-ethernet. Now I have reachability between R2 and R3 I can go ahead and add the required base config for EVPN. Note: EVPN is unfortunately not supported within a Logical System so I am configuring EVPN on the main routers. From Junos 14.1R4 the chained composite next hop features for EVPN will automatically be configured. Chained composite next hops are required for EVPN and allow the ingress PE to take multiple actions before forwarding. We require the evpn and inet-vpn MP-BGP address families. Here I am configuring an iBGP peering with R3. At this point the core configuration for EVPN is complete. My configuration gets a little more complicated here, because I need to create R1 and R4 as Logical Systems on my vMX. I will do this now. Remember that ge-0/0/1 and ge0/0/2 have been connected back to back by the virtio bridge. I will use ge-0/0/1 as the interface on R2/R3 and ge-0/0/2 as the interfaces on the Logical System routers R1/R4. Not required for this lab, but if you wanted to create multiple Logical System routers on the same vMX this can of course be done. In the example below I have created two routers R5 and R6, they are linked together via ge-0/0/1 (R5) and ge-0/0/2 (R6) with vlan 56 being used as the VLAN ID for this point to point link. You can of course configure OSPF/BGP/MPLS etc directly between these routers. The configuration is defined in the appropriate logical system stanza. Working with Logical Systems is simple and commands can be entered in a couple of ways. Configuration can also be entered directly when the CLI is set to a Logical System. I’m going to be configuring the EVPN VLAN based service. This requires a separate EVI per VLAN. An EVI is a an EVPN instance spanning across the PEs participating in a particular EVPN. There isn’t too much to the configuration. I configure the interface facing R1, and then define the evpn routing-instance. Note: If you try to configure an evpn routing-instance on a logical system, you won’t see the option for evpn. [email protected]:R1# set routing-instances evpn instance-type ? Let’s see if I can ping across the EVI from R1 to R4. Now what does this look like from R2’s perspective, we see 2 BGP paths received. Looking more deeply we can see MAC addresses in the EVPN100 table, both the directly attached device and also the device attached to R3. Here we can see EVPN database and MAC table information. Local MAC addresses are being advertised from R2 to R3. Here we can see detailed information about the EVPN routing instance. In this post I showed how multiple vMX can be configured and interconnected on the same Linux host. I also built a topology of 4 logical routers on the two vMX and used EVPN to demonstrate the capability of vMX. I’ve also completed a VPLS lab with 5 x Logical System routers running on a single vMX. If you would like to see a post on this type of configuration please mention in the comments or tweet @mattdinham.